Hello! Happy Mother's Day to all the Mom's out there!! I don't have a Mother's Day project to show you, but I do have something to show you that I worked on last weekend. A few weeks ago, one of Sabrina's teachers approached me and asked her to help with some gifts for the para aides and her colleagues. I had been working on the May MTME release projects and thought that the Pucker Up Box © would be a perfect gift for them. They were given these last week during a special luncheon in their honor. I used my trusty Cricut Expression and the SCAL software to cut out 12 of these templates. For those of you unfamiliar with the MTME © templates, you can choose what type of cut file you want (depending on what type of cutter you have - SVG for the Expression) and you also get a PDF file which you can print directly onto your cardstock and hand cut. For this project, having the Expression was a real timesaver! Because I had so many to make in a short amount of time, I cut back on some of my details. I still added the decorative panels to the front/back and sides, but I only added matting and stitching to the front panel. I was going to eliminate stitching all together, but I really like the addition of stitching to my projects and I think it's worth the effort. 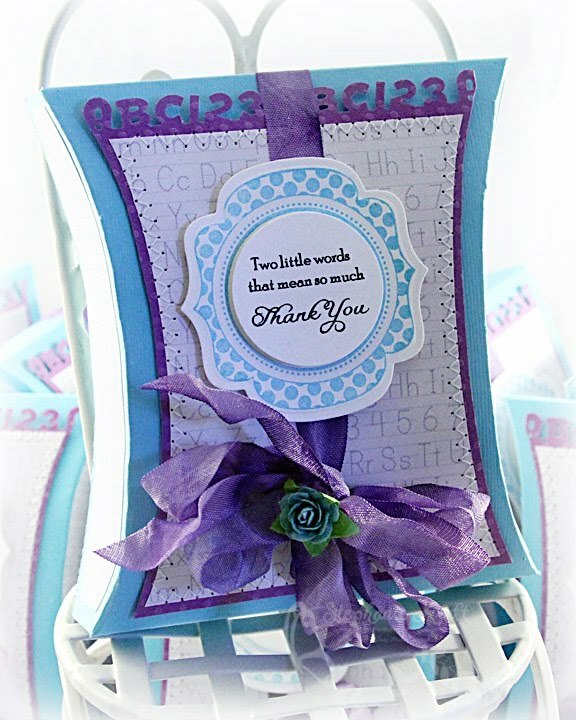 I used the school colors of light teal (box base) and purple (mat which I also added the ABC punched border to). I used more of Sara Williams' digi papers, Trace-It-ABC, from the MTME School Ruled © collection. For my label, I used Nina Brackett's Lovely Labels stamp set (GinaK) and cut it out with the coordinating Spellbinders Nestability die (Labels Nine). I stamped the sentiment "Two little words that mean so much .. 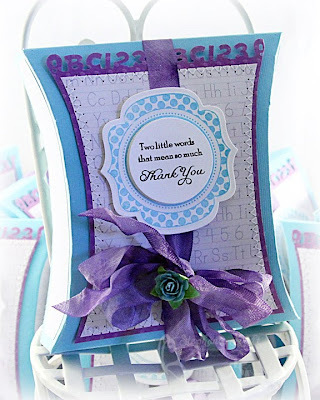 Thank You" (from Lauren's newly released MTME set, Sensational Sentiments ©, punched it out with a 1 1/2" circle punch and popped it inside the label for some added dimension. I dyed some seam binding with Tattered Angels Glimmer Mist and tied it around the box and finished off the center of the bow with a Prima rose. The boxes were filled with Hershey Kisses (who doesn't love chocolate?!)! I used the scraps left over after cutting out the templates to make accompanying cards. I kept the cards very simple. 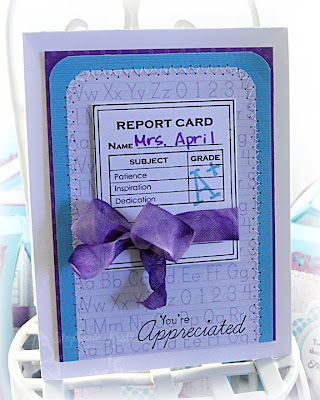 I used Make the Grade (report card) and the sentiment is from Extra Credit (both from Taylored Expressions). 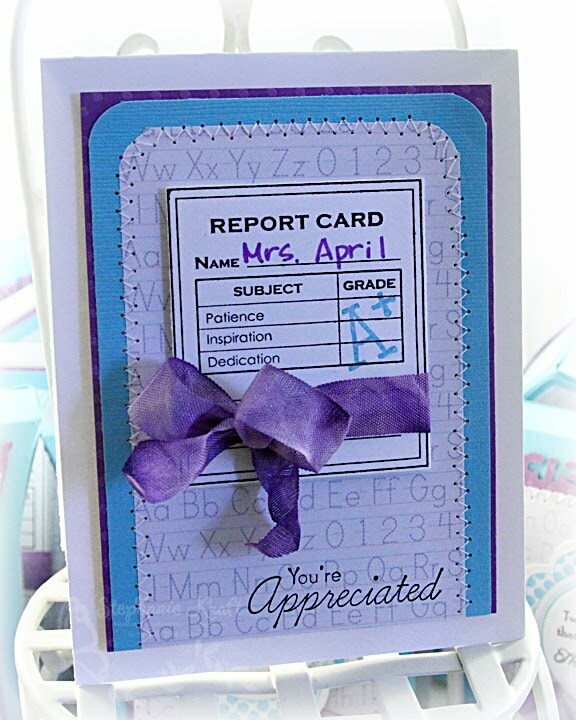 I stamped the report card and filled in the names with my Lavender Spica glitter pen, stamped the A+ and added the sentiment You're Appreciated to the bottom. I added a little ribbon and stitching and used some foam tape for more dimension. I hope you're having a wonderful weekend! Thanks so much for stopping by! Accessories: Pucker Up © template (MTME), Labels Nine Nestabilities (Spellbinders), ABC border punch, 1 1/2" circle punch (EK Success), Bind-It-All (Zutter), Lavender glitter pen (Copic), Seam binding ribbon, Glimmer Mist (Tattered Angels), Flowers (Prima and other unknown), Foam tape, Thread, Sewing machine. Steph, this is such a fantastic project!! LOVE the colors!! I'm sure they LOVED it! Happy Mother's Day! These are just darling! And I love all of the alphabets! These are just gorgeous! I eyed that border stamp yesterday but ended up getting the snowflake one instead, now I need that one too! These ROCK Stephanie! LOOOOOOVE the colors and layouts!! FAB stamps too!! These are beautiful!!!! Love the color combo, the pretty ribbon! Everything!!!! Welcome to the JR team! Those are gorgeous! What lovely colors and they have plenty of beautiful details! Absolut perfect Stephanie, the gifts are beautiful! Super cute little gifts!! Color combos are great!! Wow! What fantastic gifts!! I'm sure the recipients were wowed too!! These are fantastic--and perfect for teachers! 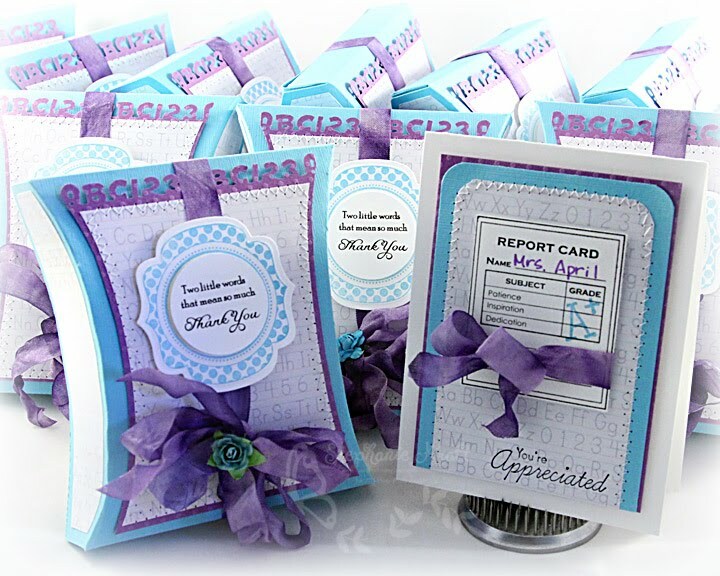 I love that you used a non-traditional color scheme for teachers! Super clever--I give you an A++++++++++!